What writer/thinker would have the expertise, the wisdom, the confidence, and the courage to write a book titled The Meaning of Human Existence? The subject is infinite and eternal, not to mention wildly controversial. Luckily, there is such a person: E. O. Wilson, Harvard Professor of Biology Emeritus, two-time winner of the Pulitzer Prize, author of over twenty books, inventor, one might say, of sociobiology, expert on ants and superorganisms of all kinds, premier ecologist, and, one could argue, the Francis Bacon, the Charles Darwin, of our time. At eighty-five years of age, Wilson is done holding back. In this powerful, slim volume he addresses the Big Questions and many readers will not be happy with his answers. Rather, “our planet was born about 4.54 billion years ago,” the Milky Way galaxy is nearly 14 billion years old, and evolution has been under way for six hundred million years, not via “advance design, but instead [through] overlapping networks of physical cause and effect.” Nevertheless, Wilson believes, humans are not the servants of instinct or environment. There are lighter chapters as well. Given the size of the universe, one hundred billion or more galaxies, with our Milky Way containing a hundred billion star systems, there is probably life somewhere else. Wilson even speculates what ET’s might look like: like ET!— a largish land animal with a big head to contain a large brain, long flexible fingers to build the spaceship in the first place, with an audiovisual sensory system. If aliens study our planet, Wilson reminds us, they will learn nothing from our science or technology—after all, they knew how to get here—but they will be astounded by our humanistic/artistic achievements. They will be in awe of Shakespeare and Beethoven, not wearable computers which read out our heart rate. But ET shouldn’t land here. Since ET evolved differently, our microbes would kill him. And because of the hundreds of light years distance, we aren’t colonizing “there” anytime soon. No, this is our planet, forever, and he once again warns us not to poison the air and the water and to love one another and the other species, not exterminate them. There is much cause for hope; we will soon be able to eliminate many diseases through genetic engineering and, “in time, likely no more than several decades, we will be able to explain the dark matter of the Universe, the origin of life on Earth, and the physical basis of human consciousness during changes of mood and thought.” But he advises strongly against genetic engineering which would change human nature itself. 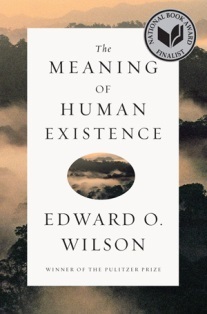 In an era when the arts and humanities seem to be receding in favor of an emphasis on STEM—science, technology, engineering, and mathematics—Wilson the scientist stresses vociferously the role of the humanities in making us human. We are a story-telling, story-loving species. We learn via stories, remember via stories. We love gossip, the minutiae of other people’s lives.